Update: Read this Part II of of this article for still better quality PCBs. I recently tried my hands on Etching a PCB using the Toner Transfer Method. This was very much a 1st take on making a PCB, and though I have been successful, there are still some improvements i will need to make in my next runs. 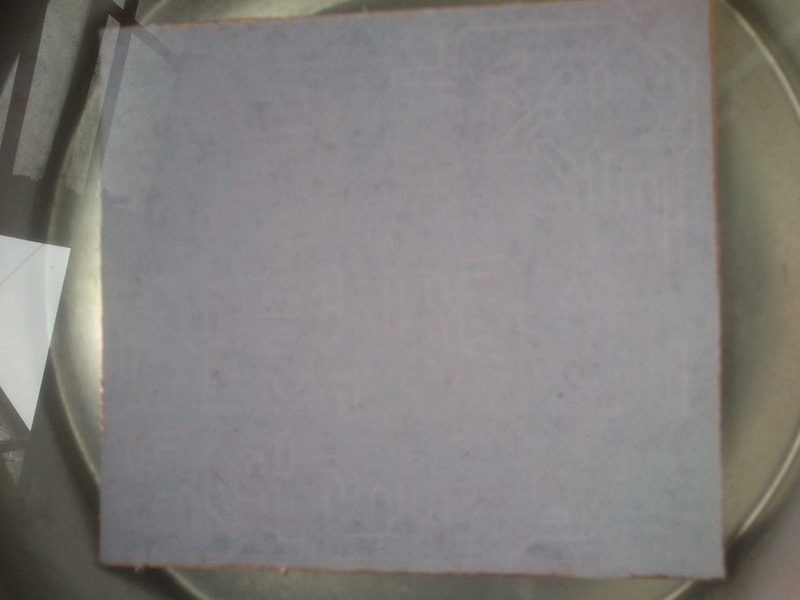 I am just posting the process I used for doing the Toner Transfer on request of my FB friends OM Indrajit And OM Ashutosh. This may help other as well ! Paper: I used normal A4 paper, I tried Photo paper and Thick magazine paper (like Stardust or Filmfare), but laser printer would mess the print after half way through. 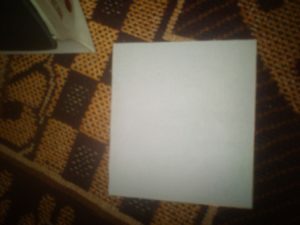 Any paper which will soak in water fast and easy to peal is good. Laser Printer: Don’t worry! You don’t need to buy one. You can use one from Work or Cyber cafe. Iron: Any light weight Iron will do. I used a Non branded Iron from my bachelor days. Plastic Box: A shallow plastic box or tray, which can accommodate your PCB for soaking in water and etching. Other minor stuff like hacksaw, cutter, water, scrubber, etc. After following many online posts and instructables, I tried using Photo Paper as well as magazine paper and printed the circuit from 3 different Laser printers at work as well as 2 printers from cyber cafe. I failed, It would just print half way through the circuit and rest of the circuit would just have splashes of ink powder sprayed on paper. It would Print pretty good on a normal A4 printing paper. So I decided to try it with that. This is what I did. Printed the circuit on a normal A4 printing paper. Cut the PCB so as to leave just around 5mm edge around your PCB. Now cut the circuit on the paper just to fit on the PCB. 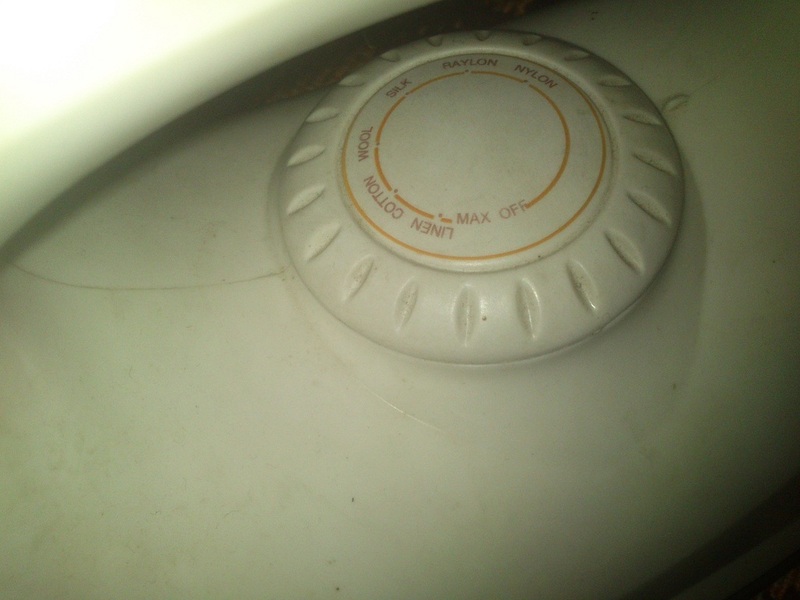 Turn your Iron to the max temperature setting (mine has Cotton/Linen written on the max temp.) and turn it ON. Light weight Iron, set it to Max temperature. Now place the paper with print side on the PCB (printed side touching the copper side). 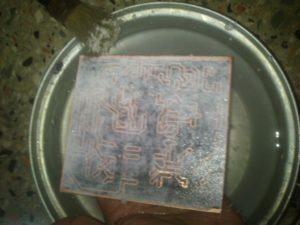 When the Iron is hot to the max setting, iron the paper on the PCB gently pressing, uniformly accross the PCB area for 2-3 minutes, till the paper sticks to the copper side. Make sure the copper is not coming off the pcb due to accessive heating, this happens with cheap/bad quality PCBs. Iron the paper + PCB gently pressing for 2-3 minutes uniformly. After around 2 minutes of ironing, check the PCB carefully. The paper should be stuck on the PCB and there shouldn’t be any bubbles left between the paper and copper. 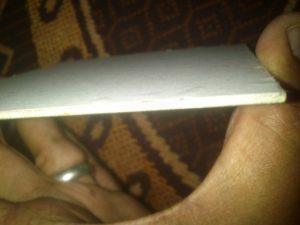 Also check the edges of PCB/Paper carefully. If you see bubbles iron again for a minute till the air is pushed out from below the paper. 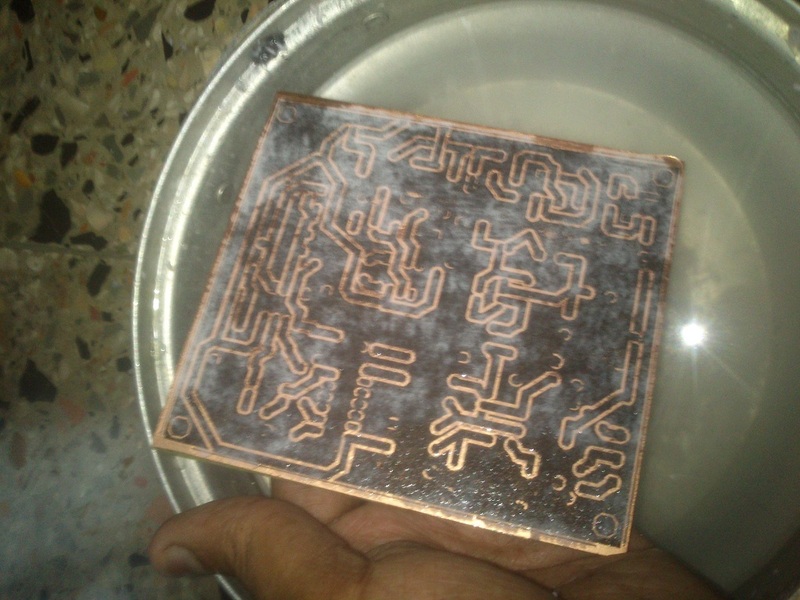 Once you feel the the print side is stuck to the copper, turn off the Iron and let the PCB cool for few minutes. Now soak the PCB with the paper in a tray or plastic box with water for around 45 minutes to 1 hour. Till the paper is completely soaked. Soak for around 45 minutes to 1 hour depending on the type of paper. Peal off the paper slowly. Remember the whole paper wont come off in one go, you will have to peal off bits and pieces slowly leaving the print stuck to the PCB. you may also use a painting brush or a soft bristled tooth brush for this. 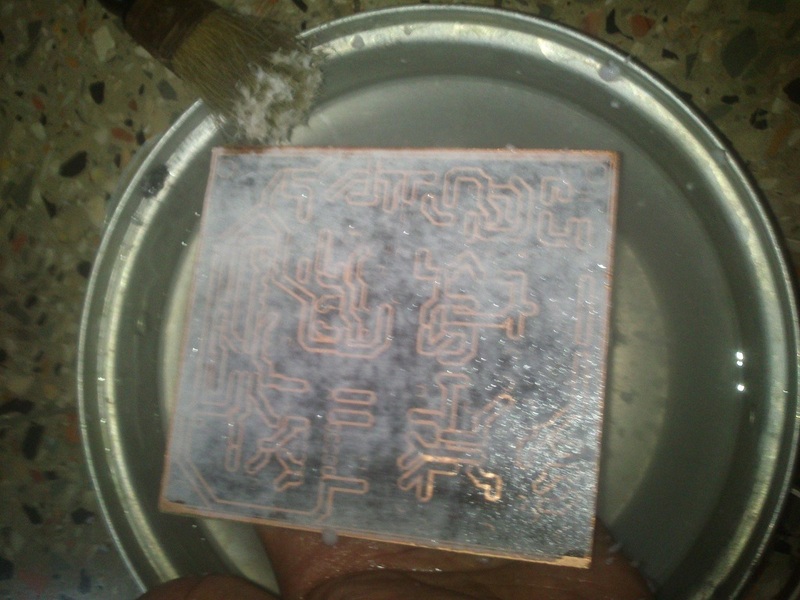 Peal off the paper leaving printed traces on PCB with soft hands. Once you feel you have removed all the layers of paper from the print stuck on the PCB, clean it may be by just holding it under the tap/running water. Etch it with the etchant f your choice, I poured most of the Hydrogen peroxide in the tray enough to dip the pcb and added around 2-3 teaspoons of Hydrochloric acid (floor cleaner acid). U can use the ratio 90:10 may be. now dip your PCB in this etchant and (unlike Ferric Chloride) just relax and stretch your arms for 10-15 minutes till the non printed copper part is etched off. Its smelly so you might even want to walk away for 10 minutes till it finishes etching. REMEMBER: adding too much of HCL will cause the print to dissolve or peal off from the PCB. Add only 2-3 teaspoons of HCL. 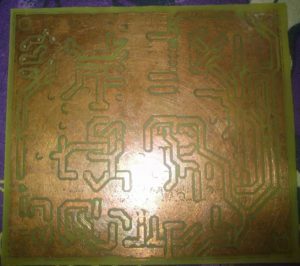 Once the PCB is etched, take it off from the etchant. Throw the etchant away. Your PCB is now ready for drilling. I have tried to make most from the least available resources. No fancy tools or things are used in this process. Just for you to remember, before comparing this PCB with your factory made PCBs. Also, after this 1st run, I have realised the PCB comes more cleaner if the thick ground plane is removed. I know, I am not very good at it as this is the first time and I would definitely love to improve my PCB making skills. May be someone from you will try and help improve this process, and I would love to update it and give you credit. Please leave you feedback, suggestions and comment below !